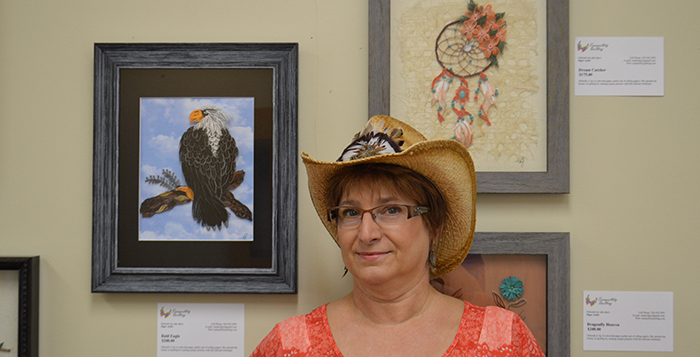 The Maricopa Center for Entrepreneurship will be displaying the quilling masterpieces of Deborah Jay for the month of September. The works of art are actually thousands of tiny pieces of paper that are rolled up and put together to create an image or sculpture. MCE will host a reception for Deborah Jay at 20800 N. John Wayne Parkway, Suite 108, on Wednesday from 6 to 8 p.m. Appetizers and drinks will be served. Jay’s art ranges from animals such as eagles and wolves to cowboy boots and figurines. She said the most unique thing she’s made was a pair of cobras. The owner wanted a portrait of his snakes, so she had to make sure the markings on each were exact so he could tell them apart.